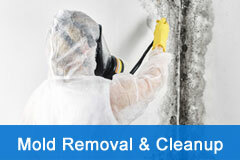 At NextGen Restoration we are experts in mold remediation, mold removal, and cleanup. Finding hard to find hidden moisture deep in the walls and drying the structure properly is the secret to preventing mold growth after water damage. If you have had water damage, also known as water intrusion, you need an expert that is highly trained with experience in water damage restoration. We are IICRC Certified Master Water Restorers. 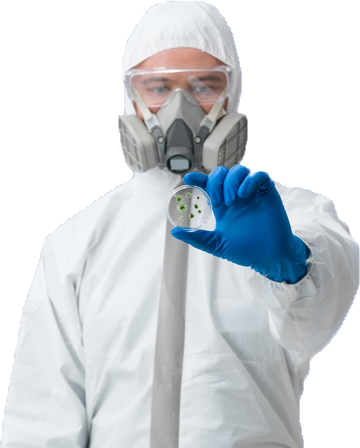 A visual inspection determines if advanced mold tests are required. Mold must have moisture to grow so first step is determining if areas are still wet and need to be dried to prevent mold growth. We use advanced technology that can even locate hard to find moisture deep within your walls. If mold is caught early you can prevent further damage but action needs to be taken quickly. Keeping the mold spores from becoming airborne is extremely important. Our techs will seal off the area and set up negative pressure then treat the area to prevent spreading mold spores. 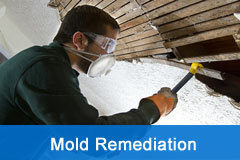 Mold remediation is the process of removing the materials that have been damaged by mold and need to be replaced. Most often this can be carpet, padding, wood flooring, drywall or cabinets. This involves some tear out and demolition but it is limited to only the damaged areas. 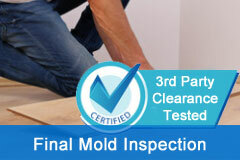 We provide independent, third party documentation to prove that your home is mold-free after the service. The clearance test we perform after a mold remediation service allows us to assess our work before we leave our customers’ property. We stand behind everything we do! Have you had water damage and they told you it was dry, but now you smell mold or is someone in your family unexplainably ill ? Is a contractor currently working on your project and you’re not sure the job is being done right? Working with insurance companies and contractors can be intimidating, and often homeowners sign off on a job without realizing it was not done correctly. Ask about our Dry Check services, you can get a Free Phone Consultation with an expert that can answer many of your questions. Don’t go it alone, we can help! Automatic wireless sensors collect moisture related data 24/7 and software documents the readings during the drying process. Our wireless sensors allow us to monitor the job conditions 24/7 Remote login for client & adjuster to see the drying progress at any time. All documentation and data collected is transmitted to a third-party secure cloud, ensuring data integrity and a clear chain of custody. Our software collects the project's complex technical data, organizes it and creates reports that are easy to read and understand. Human error, data tampering and fraud is a common problem in the industry. Our system eliminates human error and is fraud proof. 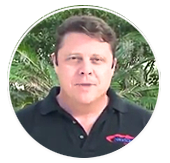 As a consultant, I train companies nationwide in the industry standards and how to properly dry structures. The terrifying truth is that most companies are simply not drying structures completely. While well intentioned, most restoration contractors do not have the tools necessary to find all the hidden moisture and resulting mold and contamination. Our system has been designed from the ground up to provide a third-party validated, transparently reported accounting of everything that’s on the job so that nothing is left hidden on the project to harm you or your loved ones. Armed with the truth, we are willing to fight alongside you, to get the necessary work performed (as required by IICRC S500 & S520 industry standards) and the resulting bill honored by the insurance carrier. Our reputation speaks for itself, we stand behind our customers so they get the job they deserve! The insurance company tried to say that there was no mold issue, but once again the data carried the day, and the insurance company backed out of its position and approved the work. I would highly recommend them and am happy to be a referral for them if you would like to speak with me. Thank you so much NextGen! What they knew about water damage, mold and restoration was invaluable and challenged the insurance company to be square with me. Without NextGen Restoration, I would be sitting in a wet, very moldy house without the money to make the repairs I needed. Thanks for telling me the truth and helping me through this mess! Upon NextGen’s arrival, they found that the initial drying, done by the “preferred provider” had not been done properly and that our home was still wet and now had mold. Our insurance company was notified, by NextGen, of the scope of the work needed to correct the problem their “preferred provider” had created! We highly recommend their services!! How Much Will Mold Remediation Cost? Because every mold remediation job is different, our experts need to talk with you and get an idea of how large of an area might be affected and what caused the mold initially. Once we learn a little more about the situation, you can order a mold inspection if needed. We can even provide a comprehensive estimate and work plan for an additional fee, which will be applied to the project if NextGen’s services are utilized. Do I need mold testing if I can see it? You won’t need testing to prove you have mold, but you need testing to confirm where the mold has spread, and what it has affected so a detailed scope of work can be written that includes not only all the damage to the building, but also the contents. What if I can’t see mold, but it smells? If you can smell mold it is actively reproducing and it’s time to get a professional on the project. Often times paint and other materials will mask the presence of mold, this is when sampling becomes necessary. Sampling can also determine the type of mold that is present. If you’ve recently had water damage and were told it was dry, but now you it smells musty, chances are your assemblies and material are still wet. It takes on average 7 to 15 days to dry most structures. 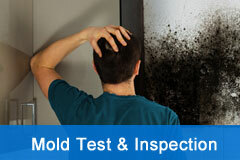 We specialize in this type of mold issues. Is mold dangerous to my health? What are the first signs of mold? If you think you have mold the first sign is a musty odor, peeling or bulging paint, gray, green or black patches and is often seen on ceilings, walls, or flooring. Mold usually grows in places such as under the carpet, behind walls, in attics and even in the bathroom. Can I use bleach to clean up mold? Bleach won’t kill mold, it can only make it unable to reproduce. It leaves behind all the toxic components behind that can inhaled and affect your health. Never use bleach on wood, carpet, drywall, etc., in an attempt to kill mold, you can cause additional damage.